Tinder posts explosive letter explaining why they're banning this 'sexist, racist pig' for life. Not all douchebags get what they deserve. But this one did. 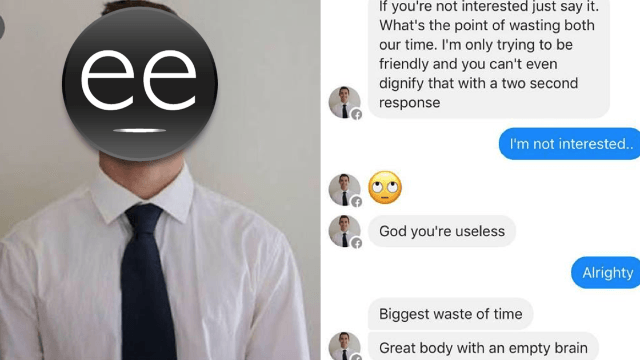 Nick's conversation with a woman went viral after an acquaintance, Kevin, shared screenshots on Facebook, and it must have made its way to Tinder headquarters. Because last week, the company's VP of Communications & Brand Rosette Pambakian published an open letter "In Commemoration of National Pig Day," announcing that Nick has been banned. For life. "We’re swiping you off the island," she wrote. "Tinder has a zero-tolerance policy on disrespect. No racist rants. No sexist pigs. No trolling. No jerks who can’t get over their own inadequacies long enough to have a decent conversation with another person on Tinder." I'm glad to see Tinder taking action against this kind of behavior. One Tinder douchebag down. Eighty-six million (an estimate) to go!